COLORFUL FUNK FROM ANOTHER AGE! We've got multicolor "bunches" of beads, plus black, white and gold in pairs (just in case you do want to wear them) as well as pieces and parts so you can create your own delicious pieces. 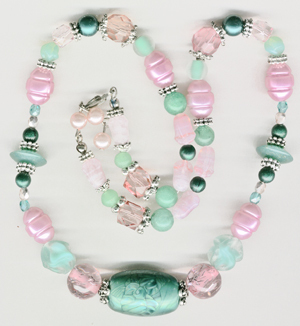 We'll be posting some of our more fabulous necklaces and bracelets, as well as instructiosn on how we made them. And you'll see some fabulous photos of these babies. Limited quantities, so we'll keep track and those with requests for matched pairs come first. Beads are high quality pearlized plastic and pretty light! 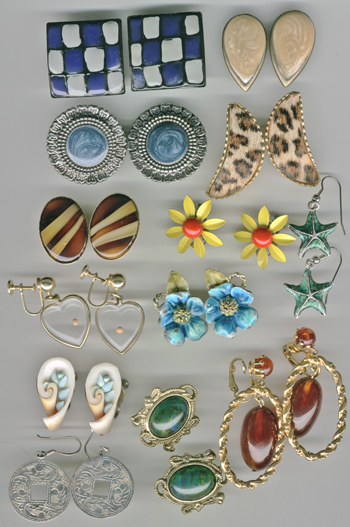 1980s to 1990s Costume Jewelry Earrings. Enamel on Metal. Most still on cards. 10 PR. In very good condition Purchase entire lot for $9.50. 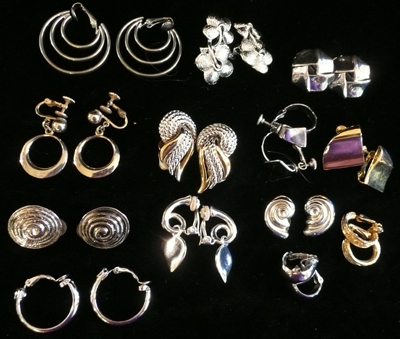 1970s to 1990s Costume Jewelry Earrings. 13 PR. In very good condition Purchase entire lot for $10.50. Most look vintage, but no obvous wear! 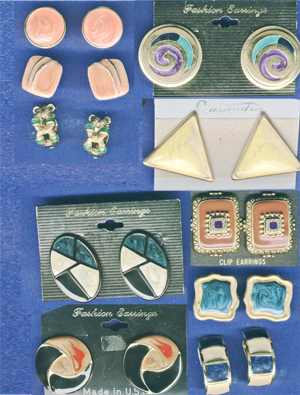 1970s to 1990s Costume Jewelry Earrings. Materials range from ceramic, lucite, gemstone, fake fur, to the usual enameled metal. 13 PR. In very good condition Purchase entire lot for $14.50. 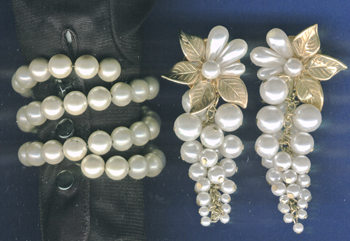 1980s to 1990s Costume Jewelry. A wrap bracelet with matching long (about 2") drop earrings that wiggle when you move. It's not gaudy at all!! In very good condition Purchase both for $7.50. 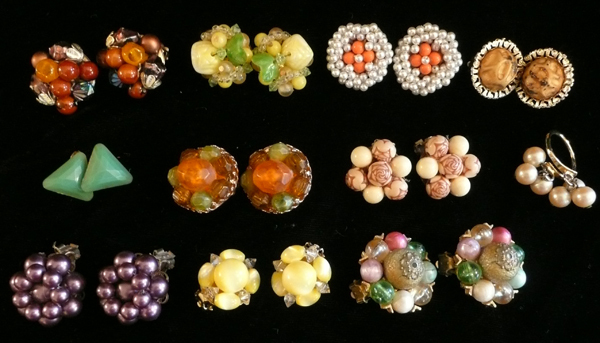 Very funky mix of traditional glass, acrylic and pearl beaded clip earrings 10 PR and one ring. In very good condition, No beads loose. Purchase entire lot for $7.50. 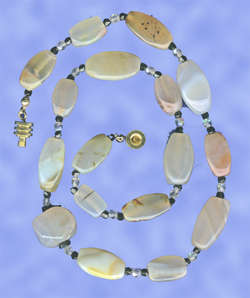 Circa 1960s Vintage 24" Necklace made with Lucite, Crystal, Art Glass and features some very unusual beads. 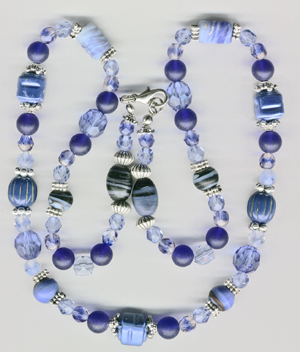 This necklace was restrung, it was brought to me in a bag, the beads secured in order with tape and lots of knots. All the beads are in the same order and nothing was lost. Ready to wear. Purchase for $15.50. A very 1950s-early 1960s color scheme and a really refreshing mix of colors and shapes! I was quite surprised at the mix of stones/beads and quite taken with the brilliant mix of tints. This necklace was restrung, it was extremely loose, had been knotted quite badly in places and there was no way it could be repaired with the original frayed string. All the beads are in the same order and nothing was lost. Ready to wear. Purchase for $15.50. 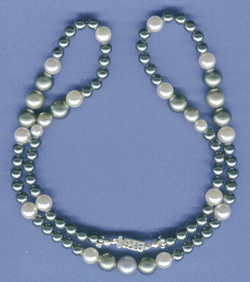 Circa 1970s Vintage Necklace made with Heamtite and glass pearls. This necklace was restrung, it was brought to me in a bag, the beads secured in order with tape and lots of knots. All the beads are in the same order and nothing was lost. Ready to wear. Purchase for $15.50. A very unique find!! Ready to wear. Purchase for $15.50. 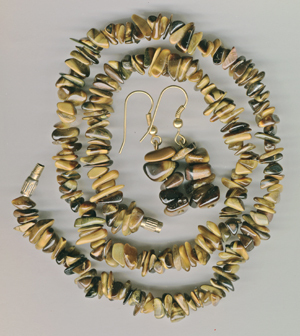 Circa 1970s this set of necklace and earrings strung with tigereye chips is a perfect specimen of its time. In Fabulous condition. Purchase for $9.50. A 1970's classic. 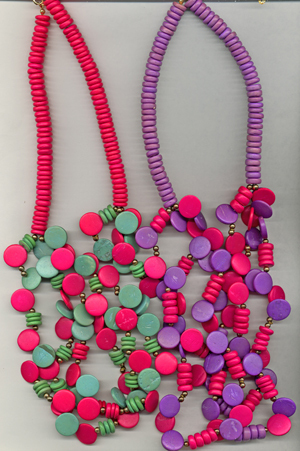 Multistrand painted wood bead necklaces in bright colors, just waiting for a tropical vacation!Great condition. Purchase both for $10.50.